SPRINGFIELD, Illinois – Kids Health Harbor, located inside SIU’s Center for Family Medicine in Springfield, has opened a clinic exclusively dedicated to providing primary medical care to children in foster care. The new clinic will complement services provided by the SIU Department of Pediatrics. Kids Health Harbor providers work directly with the Department of Child and Family Services, HealthWorks, and social workers to expedite medical care and provide essential medications to children. Many children in care require specialized services and longer, more in depth appointments. The team is also specially trained to identify and treat survivors of abuse and neglect. The clinic provides new patient comprehensive assessments for children zero to 18 years old within 21 days of entering foster care. Clinic services also include: well-baby and well-child checkups for children in foster care; after-hours phone availability; care coordination with specialists, Child Protective Services and other agencies; mental health and development assessments and treatment referrals; and foster family counseling regarding behavioral and parenting concerns. Kids Health Harbor works with the Center for Family Medicine to provide same-day appointments for sick children. In addition to services offered by Kids Health Harbor, the SIU Department of Pediatrics has been providing comprehensive primary and specialty care to foster children for many years. SIU Pediatrics also provides emergent consultation to the Illinois Department of Children and Family Services for emergency treatment for children in foster care. 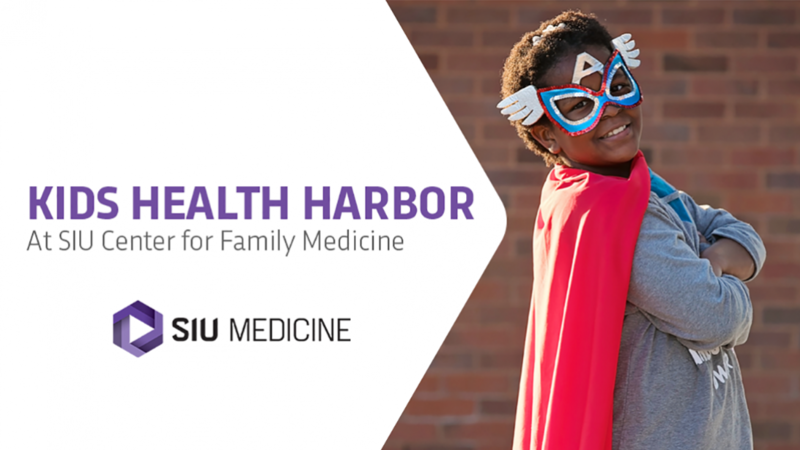 To learn more about Kids Health Harbor or to schedule an appointment, call SIU Medicine at 217-545-8000. Schedule an interview or request more information by calling the Office of Marketing and Communications at 217.545.2155.